While Roadway Construction Service (RCS) regards every phase of our operations as critically important, nothing has a higher priority than construction safety. In fact, the safety of construction zones and all impacted roads is our number one core value. Most people consider roadways and highways the primary focal point of construction zone safety. It’s easy to see why. Thousands of vehicles travel these well-worn routes on a daily basis. Rush hour boosts the traffic surge even further. With such high numbers, the risk of mishaps rises proportionately. Therefore, only the most intensive protection will suffice. And that’s exactly what every construction zone receives from the well-trained crews of Roadway Construction Service. Having attained the industry’s highest certifications, these hawk-eyed guardians set the standard for roadway safety. Our unsurpassed safety record speaks volumes about the skills these dedicated crews bring to the table. But at RCS, construction safety actually begins well before the crews arrive. Early planning and preparation are necessary to ensure the protection of every work zone. Demonstrating expertise on many levels, our planning personnel develop a range of strategies necessary to implement reliable safety measures. 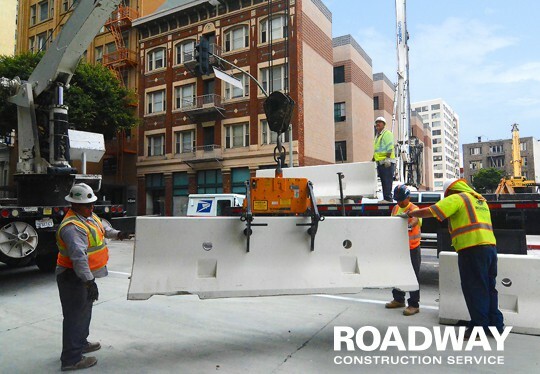 These measures include the setting up of k-rails, closing or moving sidewalks, providing alternate access to buildings, creating safe pedestrian routes through or around work zones, and establishing entry and exit points. Other aspects of pre-planned highway safety include the obtaining of permits, such as those needed for encroachment on a public right-of-way (i.e. sidewalk or highway). Thanks to the thoroughness of our planning, as well as our track record, RCS consistently breezes through the permitting process in a timely, hassle-free manner. Thus, our pre-planned safety measures are not only unfailingly reliable; they’re incomparably cost-efficient. Which Situations Call for Expert Roadway Safety Measures? RCS implements safety measures in a variety of situations. These include everything from construction zones and special events to something as seemingly simple as a damaged sidewalk awaiting repairs. RCS pays special attention to the safety of pedestrians. For this purpose, we provide fully certified flaggers with the skills necessary to protect pedestrians, bicyclists, skateboarders, and even dogs. Of particular value is our flagging crew’s ability to recognize potential problems well before they develop. Many a mishap has been averted thanks to this unique foresight. The prioritization of construction safety underscores the RCS commitment to well-protected people and roadways. To learn more about our work zone safety measures and policies, contact RCS today. You’ll discover one more reason why we’re the go-to traffic control service in Los Angeles, Orange County, Ventura County, and all of Southern California.